Mount Doug’s ECO club has started the year off strongly with invasive species removals and restoration work on Mount Tolmie continuing on a biweekly basis. 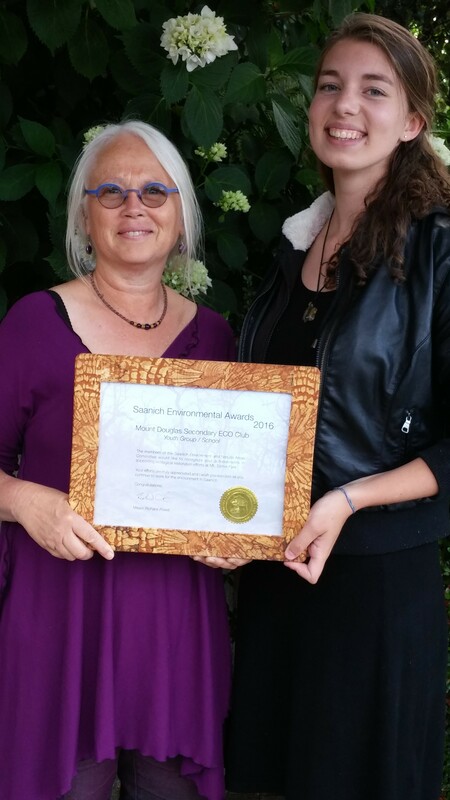 The group was recognized last spring for years of restoration work by Saanich council and was awarded the Youth / School Saanich Environmental Award for 2016! The group meets weekly on Tuesdays at lunch in room 219. Everyone is welcome to come by any time. On Friday. October 28, students will go up to Mount Tolmie to continue a long term restoration experiment. They will be removing two treatment covers and planting native seeds. In the spring, grade 10 students will be assessing the success of the treatments and seeding on the site. Students will also remove Invasive Ivy and Daphne on an ongoing basis. If you can’t come on Friday, the next removal is on Tuesday, November 15. Listen to announcements for more dates as they are planned. The club also coordinates Shoreline Clean-ups in the spring and fall at Mount Douglas Beach. The fall clean-up is this coming Sunday, October 30 from 10:30 am to noon. Permission forms are on the door of room 219.